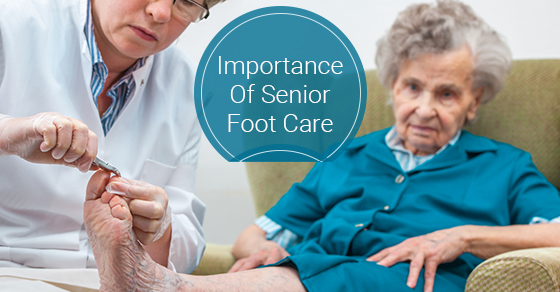 Seniors are particularly prone to various foot problems such as corns, blisters and other infections, because the skin is less thick than it used to be, as well as less elastic. They are also less able to cut their own toenails, which can lead to infections such as fungal infections, ingrown toenails or thickened toenails. These problems can lead to a loss of mobility and independence. Foot problems also make it more lit likely that a senior will become much less active, which can also contribute very negatively to their health. A reduction in activity levels will also make feet less strong and less flexible than if they were being utilized. Weak feet can cause physical pain, including backaches, leg cramps and fatigue, as feet become stiff. In turn, the physical pain can go on to negatively impact one’s mental health. The strength of one’s feet also determines posture and our one distributes his or her weight. Weak feet can cause balance problems, which can put seniors at an increased risk of falls and serious injuries such as hip fractures. Keeping your feet clean is important to warding off possible infections. To do this, ensure that you wash your feet daily with soap. Ensure that you wash in-between toes and underneath your toenails as well. Be sure to dry your feet thoroughly so that you can reduce the possibility that fungus will grow. Also ensure that you trim your nails regularly in a straight across fashion. A lack of proper footwear can damage the foot’s skeletal structure. Always ensure that your toes are not cramped in your shoes and that they have enough room. Allow your feet to breathe as much as possible by not wearing your shoes whenever possible. Shoes that expose your toes can provide a good level of ventilation. Also avoid wearing thick socks, which can limit circulation. Replace your shoes regularly. Even a small cut warrants a trip to your podiatrist, as a small cut can potentially lead to ulcers if they are not treated by a doctor. Other potential problems that require you to see your doctor immediately including having a pinching sensation in your feet or any other circulation problem. Every day, inspect that each part of your feet and toes looks healthy and does not have any growths.